With Money Dashboard's free budget planner, you can easily manage finances online. On the dashboard page in Money Dashboard, the balance trends pane gives you an overview of how the balances of your accounts changed over last month, and the current month so far. Go a little further and you can see a more detailed pane containing your balance history. In this blog we offer you a video overview and some points to take away on how to make the most of the 'Balance History' function in Money Dashboard. 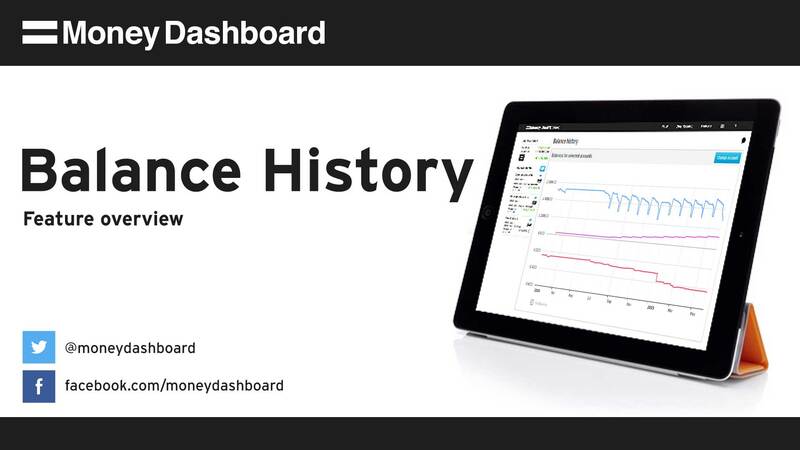 Take a look at our video overview which Money Dashboard's Max Thomas has pulled together to explain how 'Balance History' works. You can use this functional tool to learn how to budget money and achieve your financial goals - which could be saving for your wedding or just to pay off some credit cards. Each line on the graph shows the balance of one of your accounts changing over time. The colour of the line corresponds with the colour stripe next to the account name on the left hand side. Hover over any point on the graph to see what the balances of your various accounts were at that time. You can zoom in on any period by clicking and dragging. You can add another line to the graph for the total value of all your balances by clicking 'Net Balance'. The dark line shows your net balance over time. Click on 'change account to choose which accounts are shown on the chart. To take advantage of these new enhancements, visit your Money Dashboard account now. We'd love to hear what you think about our new Spend Tracker! Use the feedback function in the tracker to share your thoughts or leave us a review on Trustpilot.